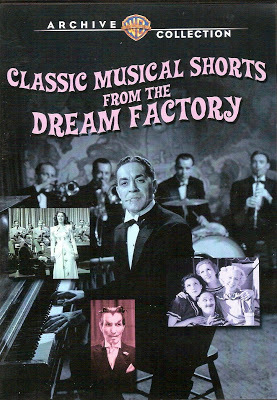 The new collection from the Warner Archive, Classic Musical Shorts from the Dream Factory, offers quite a time-machine glimpse into the changing tastes of audiences between 1928 and 1948, at least as reflected in the output of the Metro short subjects unit. All of these shorts — well, most of them, anyhow — have been previously issued on laserdisc, either in the Cavalcade of MGM Shorts collections, as part of the Dawn of Sound series, or as supplements to various features. It’s that random-supplement business that has always frustrated me; I’ve long since given up trying to remember which disc included Pirate Party on Catalina Isle with its mildly eyebrow-raising shot of Cary Grant and Randolph Scott sharing an open-air table on the beach at Avalon. And besides, while I’ve retained all of my laserdisc collection, isn’t it remarkable how quickly those things have become clunky and cumbersome? Much better and more convenient to have all these shorts together in one collection like this. The shorts are presented more or less in chronological order on the four discs. Disc 1 is from the late 1920s and shows a preponderance of vaudeville entertainers, the first resort of early sound. 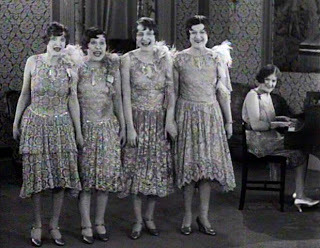 There are the unfortunately named Locust Sisters, a quartet of close-harmony singers with a fifth sister, Mathilda, accompanying them on the piano. The two songs they give us here appear to represent a sizable chunk of their fifteen minutes of fame, another chunk being their featured roles as missionaries in the 1927 Vincent Youmans Broadway musical Hit the Deck. The five-minute short in this collection, from 1928, is the first of their two appearances in a Metro Movietone Revue, and the parlor setting (these early sound shorts were often filmed on whatever standing sets were available) emphasizes the impression they give of being stagestruck amateurs rather than seasoned troupers. 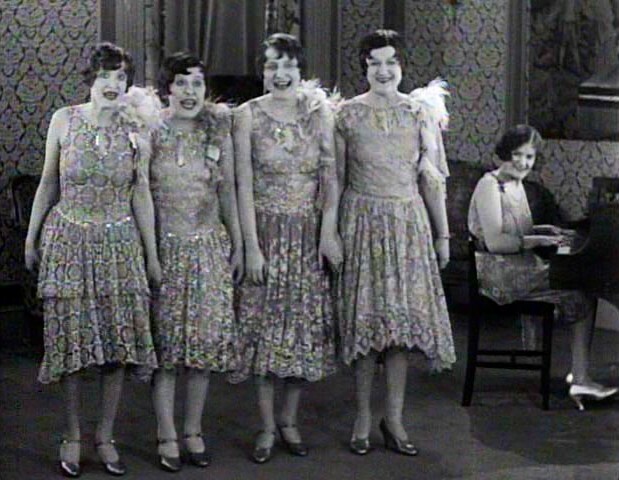 The sisters briefly recorded for Columbia Records, where their somewhat, er, matronly appearance was probably less of a handicap than on film. …as a sultry vamp with an ostrich-plume fan, singing about her old home down south in Dixie. White was clearly versatile, and the Movietone camera, cooped up in its airtight, soundproof booth, certainly took a shine to her in a way it never did to the Locust Sisters. She might have had a real career in the sort of roles that went to the likes of Joan Blondell and Una Merkel, but it was not to be. As this short went into production, she was headlining at the Palace; two years later, she would end up in jail when she didn’t have the funds to pay a $3.50 taxi fare. She retired from show business in the late ’30s and died in obscurity in 1969. Now, 41 years later, she is back to entertain us again, only to be billed as “Fences White” by the Warner Archive. Frances White — and Marion Harris, another appealing singer whose movie career quickly ended through bad timing and personal problems — may have just missed the breaks, but there are others in this collection for whom a Hollywood career was probably never in the cards, no matter what. Gus Edwards’ Kiddie Revue is a case in point. 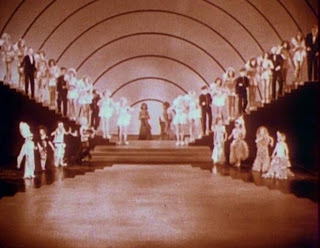 Originally produced in two-color Technicolor that has now faded to a dull sepia, the charms of its performers have tended to fade with the hues. Gus Edwards was a personality who is difficult to explain to people today, but in his own time he was nearly as famous and influential as George Lucas or Steven Spielberg are now. A composer of popular songs (“By the Light of the Silvery Moon,” “In My Merry Oldsmobile,” “School Days”), producer, impresario and entertainer, he also had an eye for young talent, and many of the kids he featured in vaudeville from 1905 to 1925 went on to major showbiz careers. Alas, no such happy fate awaited the mostly anonymous moppets in Kiddie Revue; on the whole, this 1930 short goes far to prove that the cute-kiddie schtick wasn’t as easy as Shirley Temple would later make it look. It’s not that these kids have no talent; on the contrary. 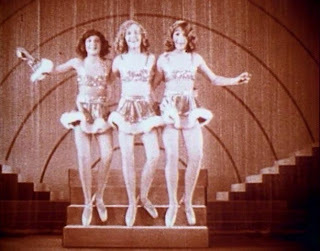 Take these three young beauties, for example, tapdancing in ballet toe-shoes up and down steps in perfect unison; they have a skill and stamina I’ve seldom seen anywhere else. And they are pretty and nubile enough that the camera records their routine with as much pleasure and enthusiasm as they perform it. But where did they think such an act could take them? In vaudeville, it might have lasted them for years, even decades. In a movie, you do it once and within weeks it’s been seen by maybe millions of people; at that point you’d better come up with something new — the mid-twentieth century is strewn with the career wreckage of vaudevillians who never learned that lesson. Besides, seeing an act like this on stage is one thing; in closeup on a big screen, audiences in 1930 must have winced — “Jeez! That must really hurt!” — just as we do now. No wonder tip-toe-tapdancers like these don’t show up in a lot of movie musicals. Other acts in the Kiddie Revue are odd to the point of being vaguely alarming. A fashion show finale, “Babies a la Mode,” testifies that the beauty pageant excesses we see in Little Miss Sunshine and the short, sad career of JonBenet Ramsey are not a recent development. But oddest and most delightfully alarming of all is this young girl who performs a complete tap routine while bent over backwards with her hands flat on the stage floor. Such virtuosic agility deserves more than the anonymity of faded Technicolor, but unfortunately her name has not come down to us. Does she by any chance have a child or grandchild out there who is reading this now? Or can it be — it’s barely possible — that she herself is still among us? I’d be delighted to hear from you. But we can’t let it go with just a single frame enlargement. Here’s a YouTube clip that includes her performance. Our girl turns up 2 min. 48 sec. 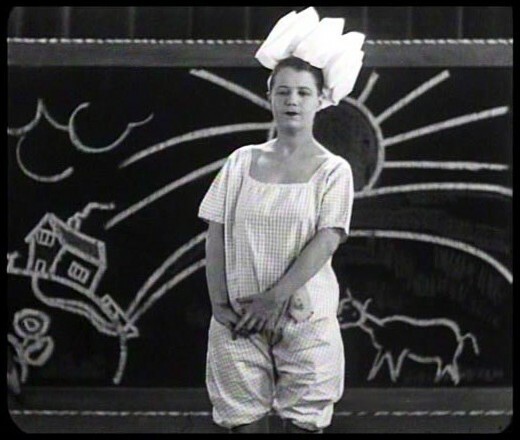 into the clip; before that, you’ll see the mop-top little emcee, child actor Douglas Scott, introduce one “Madame Azusa” with a preternaturally clever send-up of stuffy coloratura sopranos (“A little bit of opera goes a long, long way…”). Then it’s our girl front and center, and it’s simply the damnedest thing you ever saw. Steve, the sultry vamp costume and ostrich fan I've pictured here went with "Heart-Breakin' Creole Rose". 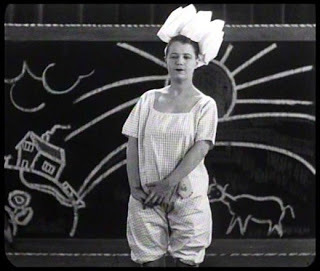 "There Will Never Be a Sweeter Story Ever Told" was the first segment, with Miss White in that 1890s bustled outfit (not shown). That segment also interpolated "Comin' Thro' the Rye" and Dvorak's "Humoresque", both with humorous new lyrics. What makes Louisiana dear to my heart? If you're interested, of course, you can get the lyrics to all three songs off the DVD collection itself, which is still available here from the Warner Archive. Between Frances White and the other entertainers featured here, it's well worth the price.